Sky tech BD is one of the best display banners ads agency in Bangladesh. Now a days, the impotency and the credibility of web display banners ads growing day by day. 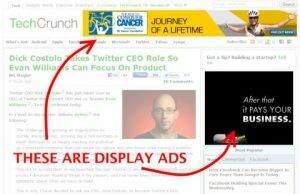 Display banners ads is advertising on websites. It includes many different formats and contains items such as text, images, flash, video, and audio. The main purpose of web display banners advertising is to deliver general advertisements and brand messages to site visitors. Sky Tech is one of the largest display banners ads network in Bangladesh. It has a platform to serve 20 million impressions per day through a network of 5000+ local websites and mobile apps. Our advertiser portfolio includes major Telco, FMCG, Financial Services, E-commerce, International Airlines, Small and Medium Businesses etc. Browser- Mozilla, Safari, Opera Mini etc. Device- Desktop, Mobile (Samsung, iPhone), Tablet (iPad) etc.